Rocky is learning how balance books and tax returns. Rocky says "Don't Cry, There is Still Time To Get Your Tax Return Completed"
For over 25 years, Carpenter’s Tax & Accounting has, and still offers top quality, year-round, expert professional tax services. We specialize in complete and accurate tax preparation, tax and small business consulting, collections and audit representation for individuals and small businesses from our offices conveniently located in the Portland, Oregon. We can represent you before the IRS and Oregon Department of Revenue. We can handle multiple year non-filing problems, as well as installment agreements, and offers in compromise. We have extensive training from the National Tax Education Institute in dealing with the Internal Revenue Service, in both collection issues and audit issues. Each year we individually maintain over 30 hours of continuing education in order to keep abreast of the latest tax issues. 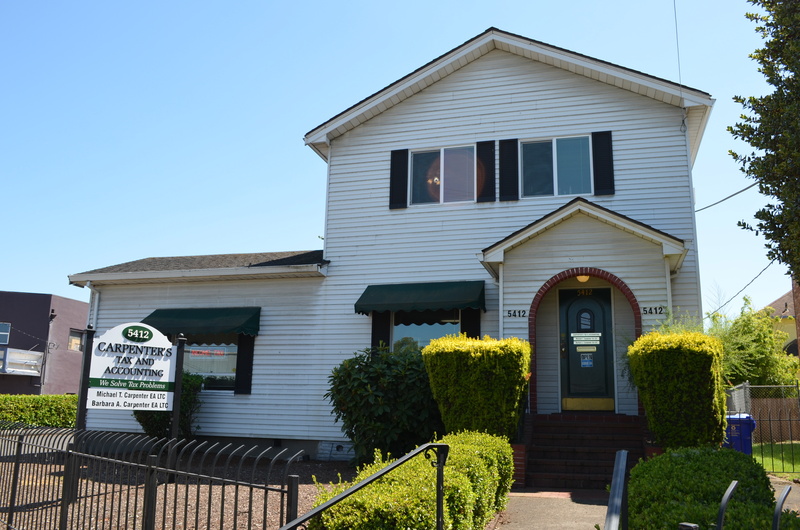 Our qualified professional staff, includes the team of Mike and Barbara Carpenter, both Federally licensed Enrolled Agents and Oregon Licensed Tax Consultants, who will personally tend to all of your accounting and tax filing requirements. Both Mike and Barbara are NTEI Graduate Fellow’s with extensive knowledge and experience in dealing with the IRS and Oregon Department of Revenue. NTES is the National Tax Education Institute, which is put on by the National Society of Enrolled Agents. Enrolled Agents (EA’s) are federally licensed tax professionals who have technical expertise in the field of taxation and are licensed to represent taxpayers before the Internal Revenue Service at all administrative levels. In addition, EA’s are the only tax practitioners required by federal law to maintain their expertise through continuing education. Both Mike and Barbara have passed the grueling two-day four part EA exam which covers every aspect of tax law. The IRS allows former IRS employees to become EA’s without taking an exam. CPA’s and Attorney’s are licensed by the State of Oregon. Oregon law requires that all tax preparers in Oregon be licensed. Licensing requirements are maintained by the Oregon Board of Tax Practitioners. Licensed Tax Preparers have successfully completed an 80 hour course in tax law, and have passed a state exam. Licensed Tax Consultants (LTC’s) are licensed through the Oregon Board of Tax Practitioners, after successfully passing a state exam and working under the supervision of a Licensed Tax Consultant for two or more years. Oregon Licensed Tax Consultants, Licensed Tax Preparers, and Enrolled Agents are required to maintain at least 30 classroom hours of continuing education in the tax field each year. Visit our site often as additional news and helpful information will be continually added in an effort to serve you better. Please, feel free to browse our website to see the services we offer as well as the many helpful resources we provide. When you are ready to learn more about what we can do for you, we encourage you to contact us.